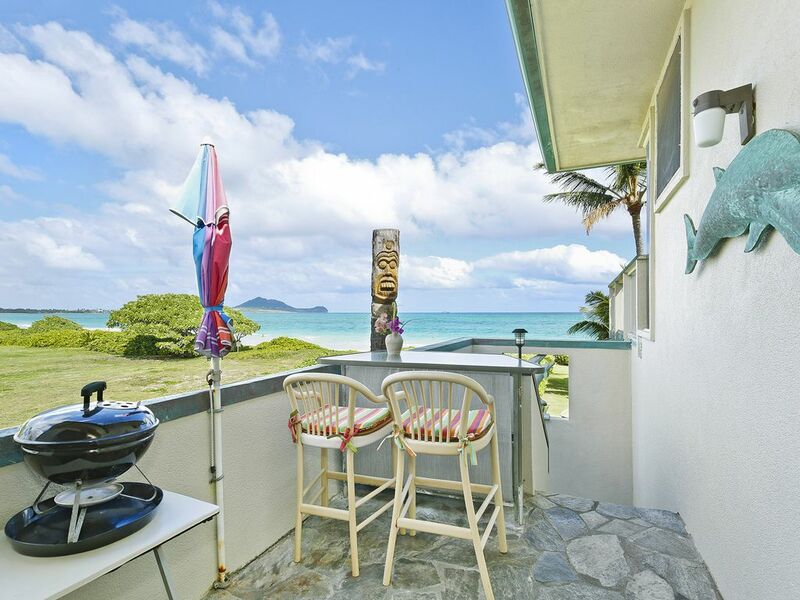 Best Price and Location on Beautiful Kailua Beach! Beutiful, modern, tropical all ammenities. I have provided for more than 30 years excellent service and accommodations to visitors and guests from all over the world, many come back time after time. My beach front studio is located right on beautiful sandy Kailua Beach. It is quiet with private entrance and private bathroom, modern, spacious and tastefully furnished. The tropical beachfront yard is there for you to enjoy...... walk, jog, swim, surf or kite surf on beautiful Kailua beach at your door steps.....or just .relax in the sun...fall asleep to the soothing sound of the waves rolling in. Located in a quiet, upscale neighborhood. Beautiful ocean views from the balcony overlooking the beach and ocean. No better place to spend the perfect vacation in beautiful Hawaii. We provide free onsite parking and wireless internet access, air conditioning, overhead fans, complete kitchenette. Excellent shopping, restaurants, and amenities are all nearby. Honolulu, Waikiki, and the airport are all thirty minutes away by car. Our lovely unit is private, quite, clean, fully furnished, and reasonably priced. It is managed and run with Aloha by the friendly owners since 1985. We speak English, German, and Spanish. We are not a booking agency. We are members of the Kailua Chamber of Commerce. Reasonably Priced at $219.00 per night for a studio right on Kailua Beach, Oahu. This unit is located on the second floor. We also do have a studio with same amenities, same price, same location located on the first floor. The VRBO listing # is 1405754. A Lovely modern unit offering all amenities you do need to spend the perfect vacation in Hawaii and on peaceful Kailua Beach, away from the crowds in Waikiki. Located right on sandy Kailua Beach.....perfect for swimming, surfing, wind surfing, walking or just relaxing on the wide sandy beach to the sound of the soft trade winds and waves rolling in.....very peaceful. Lovely, unobstructed ocean and beach views. directly on, or only steps to beautiful sandy Kailua beach. Toaster oven, microwave oven, stove top. Beautiful large beach front yard with tables, chairs and launges, overlooking the ocean. The suite was simply perfect for our needs. It had everything we needed and the location is simply wonderful. We loved the little bar overlooking the beach and had many meals there, enjoying the view and the sound of the waves. Eva is a thoughtful and gracious host. The town of Kailua is a charming little beach town, very close to the property and has many stores and restaurants. Overall we loved our visit here. We were very pleased with Eva's studio! We have stayed at several VRBO's on the other Islands but this was our first on Oahu. Eva provided a warm welcome and was consistent in checking in with us every couple of days to see if there was anything we needed. The premise is situated right in the middle of beautiful Kailua Beach which allows you to swim, suntan or just lay about and take it easy. The beach stretches to the right or left from the front of the property and is busy enough that you don't feel isolated but is by no means crowded in any way. A return walking trip in either direction is about 45 minutes. The studio itself is on the second floor with a patio view that takes in most of the beach providing a great place for coffee, a beer or having a meal. The suite is roomy enough for two, well decorated and practical with a firm bed. The kitchen comes with a studio size fridge/freezer, microwave, toaster oven, toaster, coffee maker and induction plate. We like to cook for ourselves mostly and were able to do this with what was supplied. Kailua is about 3 minutes away by car and has everything you need from a Whole Foods to a natural grocery to the usual Times and Foodland grocery stores. Lots of restaurants and a great mid week market on Thursday morning at the elementary school for lots of fresh fruit and veggies and a Thursday night market in the town for a great assortment of interesting food vendors. From Kailua you can easily head north for a great drive to all the high surf beaches or plan a 30 minute drive into Wakiki to check out the tourist mayhem. We loved it here and wouldn't hesitate to return on any return trips to Oahu! Cute rental with everything you need. Just steps to the beach. My husband and I stayed in the upstairs studio and it was perfect for our stay. You can’t get any closer to Kailua Beach. The rental is conveniently located within a mile or so of great restaurants, groceries and everything else you need. The hosts are very friendly and available to answer questions about the area and rental. We’ll be back. Eva and Herman could not be more gracious in providing us with everything we needed. This very spacious studio right on a gorgeous beach was just as pictured. We loved the down stairs studio. Lots of out door space to relax, and easy access to the beach where we walked many times a day. Boogie boarding was terrific and had I had a surf board I definitely, as a beginner would have had fun! I would definitely come back! Loved this rental! Right on the beach, beautiful view of the ocean and surrounding area. Right in beautiful Kailua/Lani Kai area. Everything we needed in this spacious upstairs, studio unit. This unit comes with the 3 B's - Beach chairs, Boogie boards and BBQ! The unit has everything you need to have the comforts of home - an electric pan to cook with and a small bar fridge and microwave, so everything you need for a full working kitchen is here. Also internet, TV, a blow dryer, curling iron and straightening iron were here to use as well. Unit is air conditioned, but the breeze was so nice, we didn't want to do without the sound of the waves crashing at night, lulling us to sleep, so we just kept the windows open. Unit had on site parking as well. Eva and Herman have thoughtfully provided suggestions on activities, dining and other amenities in Kailua town and nearby. Eva and Herman are wonderful people who have thought of everything and made our stay just perfect with their special Aloha! We HIGHLY recommend this unit and would give it AND the landlord's 10 stars if we could, but since there are only 6, that will have to do. We can't wait to go back! Mahalo for a wonderful stay! We visited Kailua last week. Our stay in the 2 bedroom 2 bath was wonderful. It's so close to a quiet beach. I walked on the beach every morning at sunrise. The house was super clean and the grounds were lush and tropical. The only negative I would say is that it was hot while we were there and the cottage got a little stuffy. I would go back in a heartbeat. Herman was awesome. Just relax on beautiful white sandy Kailua beach, take in the sun and dream to the soothing sounds of the the waves breaking on the shore or walk miles and miles along sandy Kailua beach. Cancelation policy....if you cancel 30 days or longer before arrival there is no charge. If you cancel within the 30 days before arrival we will charge your credit card account in the amount of $ 200.00. Cancellations made within 8 days before your arrival date, or "no shows" will be charged the entire amount due.